The Ten Mile Haul Road, running almost -- you guessed it! -- ten miles north from Fort Bragg right along the ocean, used to be the lethal habitat of giant logging trucks, too big and heavy for the highway. The northern end of this decaying thread of asphalt runs through dunes and along the lonely, booming beach, and provides a great place to walk in an other-worldly environment. Off the tourist track, walkers seldom see anyone else along the northern end of the road. Access to the northern section of the old Haul Road can be gained from three places. For the best part, access the Road at its north end, parking (limited) at the south end of Ten Mile bridge and taking the trail that starts at the western edge of the small parking area and winds through high brush before plunging down a sand dune to the old road. In Spring, enjoy the cliff swallows that nest on the bridge. The walk from the north end starts northwest, but curves and at a half mile heads south on a "tangent" -- a long straight strecth, in this case almost 1 mile long. At 1.78 miles you cross Inglenook Creek, and half a mile later you cross the drainage of Sandhill Lake just over the dunes inland (and a carefully protected area.) The road vanishes beneath the dunes at about 2.68 miles, at which point through walkers will take to the beach. From here, it's a mile to the point where the Haul Road resumes north of Ward Avenue, and 1.25 miles to Ward Avenue. From Ward Avenue to the parking lot at Laguna Point is just over 1 mile. There is no appreciable elevation gain or loss along this walk. Parking at the end of Ward Avenue provides better access to the endless beach, because the section of the Haul Road north for two miles has been reclaimed by the ocean. 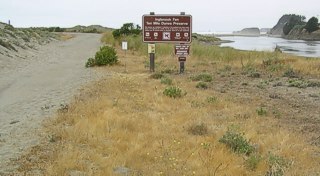 From Ward Avenue, the better walk is south along the Haul Road to McKerricher State Park, which also provides access to the Haul Road and abundant parking. Day-use access to the Park can be gained without paying a fee by turning west on the road just north of the "official" park access, beside the Purple Rose restaurant. McKerricher Park also provides access for the southern section of the Haul Road. The entire section of the Haul Road north of Virgin Creek is a wildlife conservation zone, an important nesting and resting area for migratory birds. Consequently, dogs are not permitted in this area even if they are on a leash. The Ten Mile Dunes are apparently desolate, but on closer inspection you will see how lively they are. For many years this was a dune-buggy playground, and the delicate flora and fauna are just beginning to recover. Officially, this is the Inglenook Fen Ten Miles Dunes Preserve, established to protect the habitat of endangered species. Please observe and respect closed areas. There have been dunes here for centuries, and dangerous conditions exist only along the eastern edge, where the dunes continue to march into the forest. Walking in the dunes is nevertheless demanding, and so a "short cut" across them is seldom a time saver. Short forays into the dunes from the Haul Road are the best way to experience this precious and fragile area while doing minimal damage to it. This Preserve is a testimonial to a maturing human understanding of the fact that the purpose of life on the planet may be more complex and valuable than merely serving as a source of profit and amusement for our species. By virtue of its remoteness and the relatively difficulty of reaching it, the Dunes is a magical place, and the Haul Road provides a decaying remnant of a paved road from which we may enjoy it. "Improving the quality of all life in Caspar"